Looks Good from the Back: Marianne: Flares, Again. I have tried flares before and no. Nope. The AG Farrahs just did NOT work on me.The wash was too light, the denim was too soft and stretchy, and they just weren't flattering. But am I the only one experiencing Skinny Jean Fatigue? I've been wearing my Pilcro Stet Slim Boot jeans to DEATH, so when I saw these Pilcro Superscript Flares on eBay, I made a ridiculously lowball offer (always make an offer!) and got them. And they are great! The wash is darker but still has some of that retro faded vibe (though I'm kind of loving this even darker wash). The denim is much more substantial and the wide, two-button high waist is flattering. I ordered a size smaller than usual because I've lost some weight, and they are a touch tight, but in another 3-4 pounds they will be perfect. 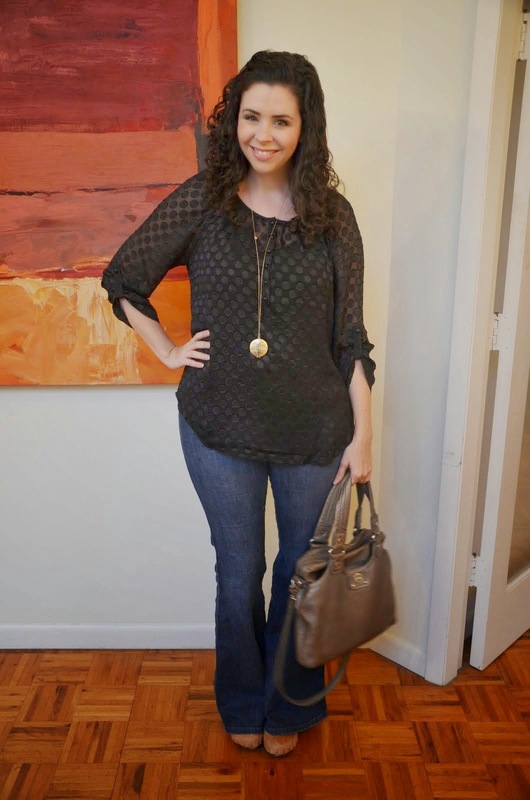 These jeans look best paired with flowy tops (and my favorite locket looks best with this kind of top too! ), so I am finally wearing the Pale Sky Swiss Dot Blouse I got for Christmas. I don't know what took me so long? It's really pretty and 50% off right now if you want to snap one up. I think it would be cute with white jeans if it EVER warms up. I finally put my beloved Rocco away for the winter and drug out this muted gold Marc by Marc Jacobs Mag Bag (they don't make it any more but this one is a similar shape and color). It's a little beat up but I still love it. And of course, my early spring footwear of choice, clogs. For crying out loud it's almost April, can it please be sandal weather? Sigh. talk more about low ball offers on ebay....I didn't know it was possible...do you chat with them? Some auctions have "make an offer" as an option. If they do, ALWAYS make an offer! But do know that you will be committed to buy if they accept it. I usually start at half the asking price and sometimes they accept right away! Stopping by as I saw your blog mentioned on Gretchen's closet and I see that you are my kinda gal - jeans and clogs .. oh, that's my kinda wardrobe! 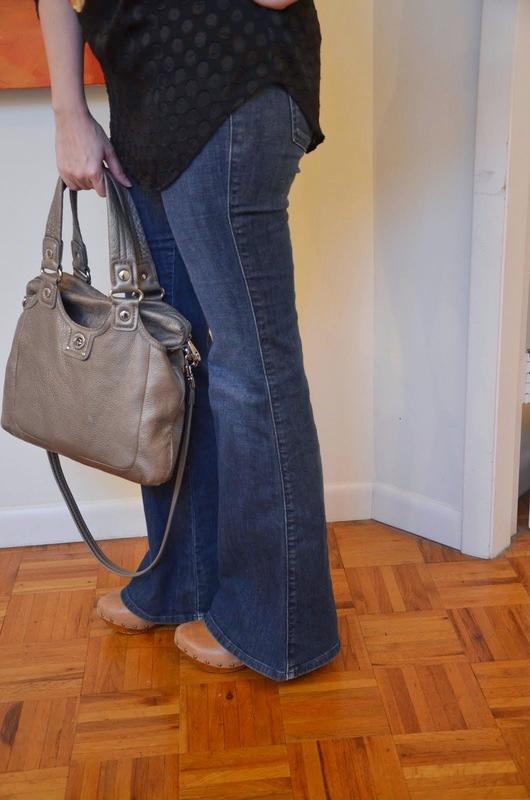 I'm all over flares lately - I tried out some cheapy flares from American Eagle, of all places (high rise artist in extra tall) and they are surprisingly awesome. Inspired, I ponied up for a pair of boot cuts from Tallwater and they are AMAZING. Flare on. I love my skinny jeans because they are so easy and comfy, but ugh, I am hurtling towards the saturation point with them. 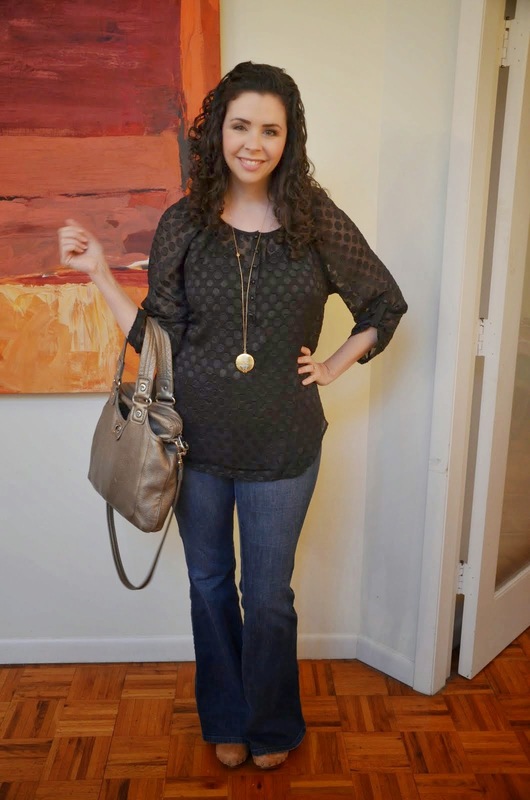 Can't figure out which cut to transition to, but I really like these jeans you've blogged about. P.S. You look fantastic in that top. I saw it online and was going to buy it but wasn't sold on it. I think you've sold me on it. Piperlime should be giving you commission!